By most accounts, the Wright F3W Apache was an unremarkable biplane of the early 1920s, built to a US Navy request for a fighter plane, float plane, and scout plane. The Apache was originally designed around a Wright Whirlwind radial, but that engine proved underpowered, and the Wright P-1 Simoon radial engine which replaced it was plagued with problems and never went into production. Searching for a powerful and reliable engine, Wright settled on a brand new engine built by a brand new company, and the unassuming Apache was suddenly thrust into the annals of aviation history. At the beginning of the 1920s, the spinning rotary engine of WWI had been left behind and liquid-cooled, inline engines, such as the Liberty L-12, were in vogue. While these engines provided ample amounts of power, they were heavy, and the radiator was an Achilles heel that could bring down an aircraft with a single bullet. The US Navy had shown interest in the development air-cooled radial engines, but the ones developed by Wright Aeronautical had so far proven underpowered and unreliable. The stage was set for a new player to arrive on the scene, one who could solve the problems of both power and reliability. In 1925, Frederick Rentschler, who had worked on the Simoon radial engine at Wright, left the company and approached the owners of Pratt & Whitney Machine Tool with the idea of producing a new aircraft engine to satisfy the requirements of both the US Navy and Army. With $250,000 in seed money and the rights to the Pratt & Whitney name, Rentschler, along with George Mead, Andy Willgoos, and Donald Brown, began work on developing an engine that they hoped would produce 400-500 hp and weigh less than 650 pounds. By comparison, the Liberty engine produced the same amount of power but was 200 pounds heavier. 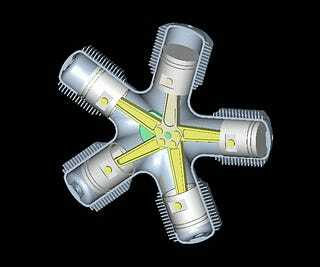 Radial engines work by having an odd number of cylinders arranged around a central crank shaft. One cylinder connecting rod, called the master rod, attaches directly to the crank, while the others attach to a plate on the master rod, all of which is offset by a counterweight. Traditionally, the master rod was made of two parts that bolted to a solid crank, but that bolted cap tended to be a weak point as the engine was run to full power. Rentschler’s team turned that design around and developed a solid forged master rod that connected to a two-piece crank, all housed in a two-piece forged crankcase. The result was significantly lighter engine which was also considerably more reliable. In its first series of static tests, the new engine, named Wasp by Renstschler’s wife because of the noise it made, generated 420 horsepower, exactly what the Pratt & Whitney team designed it for and, more importantly for the new company, exactly what the Navy wanted. The Wasp was installed on the Apache and left the ground for the first time on May 5, 1926, instantly transforming the pedestrian fighter into a high-flying test bed. The sole F3W now became the XF3W test aircraft, and the Apache and the Wasp began setting altitude records with flights by pilots C.C. Champion and Apollo Soucek at the controls, culminating with a seaplane altitude record of 38,560 feet and a landplane record of 43,166 feet. It was also flown by NACA to test engine cowlings and other design elements. As for the Wasp, it was on its way to becoming one of the most prolific aircraft engines of all time. Its basic design allowed it to be enlarged (and made smaller) over time, growing from its original 9 cylinders to the massive 28-cylinder R-4360 Wasp Major (the letter R indicates radial, while the number indicates the engine’s displacement in cubic inches). Nearly 35,000 R-1340s were built, but the whole series of Wasp engines—R-1340, R-985 Wasp Junior, R-1830 Twin Wasp, R-1535 Twin Wasp Junior, R-2800 Double Wasp, and R-4360 Wasp Major—number approximately 400,000, with many still flying to this day. And the company started by Frederick Rentschler Pratt & Whitney remains one of the world’s leading producers of aircraft engines.